New York Strip Loin Roast with Garlic-Herb Crust recipe is a wonderful holiday meal to prepare when you want to pull out all the stops and impress people. 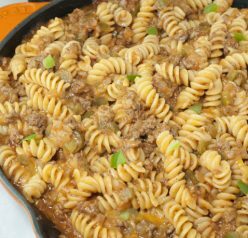 It is simple, yet tastes like something out of a 5-star restaurant! Hi, guys! I hope everyone had a great holiday and spent lots of quality time with family and ate better-than-good food. If you have a special occasion dinner this week (or anytime in your future) I have the perfect roast for you that I promise anyone can make, even beginner cooks. This New York Strip Loin Roast is the best! I only cooked my first roast about three years ago because I was always super intimidated by it. Mr. Wishes and I made Beef Wellington when we had our family over for Christmas dinner. Beef Wellington is not something to make often as it can be very costly and kind of has to be reserved for when you’re feeding a big crowd. Therefore, I did not have a practice run. Thankfully it tasted AWESOME, although the puff pastry and mushroom layer kind of slid right off the tenderloin as we cut into it. It looked nothing like the photo in my cookbook, but you live and learn! I’m so glad you’re here! Follow along on Pinterest for more inspiration! The second roast I made at home was two years ago, also for Christmas. You guessed it – it was this New York Strip Loin Roast with Garlic-Herb Crust (I had made a strip roast once before, but with help). This particular roast has sort of a sentimental value to me as I had prepped it on Christmas Eve, the day before I was going to cook it. My dad came over to pick me up at my house and he asked me to see the roast. He knew about it because I had called him earlier that day with a question regarding the rub (he loved it when I called him with cooking questions). He looked at it in all it’s beauty with that herb rub and I could see it in his eyes how proud he was of me. He gave a little chuckle and said “I can’t believe you cook now!” He passed away a couple of weeks after that and I was glad he got to see that I had learned to cook “real” food like this New York Strip Loin Roast, not just macaroni and cheese from a box. I made the Garlic-Herb rub using my brand new, fancy Hamilton Beach Professional 14 Cup Dicing Food Processor and served my delicious lemon roasted brussels sprouts on the side. It makes my life so much easier in the kitchen! It has an adjustable slicing blade with 14 thickness settings so you can quickly create the thinnest potato slices. The dicing blade allows you to cut uniform ingredients for salsa, chutneys and more (such as tomatoes and onions). I absolutely love this thing. Do you have Christmas gift cards to spend? How about a little belated gift to yourself! There’s less pre-cutting of ingredients needed because of the 3-in-1 “Big Mouth” feed tube, which happens to be one of the largest on the market. The bowl stacks directly on the base (no twisting required) and the lid snaps securely to the bowl with a heavy-duty die-cast locking arm. I thought the locking arm was a really cool feature! 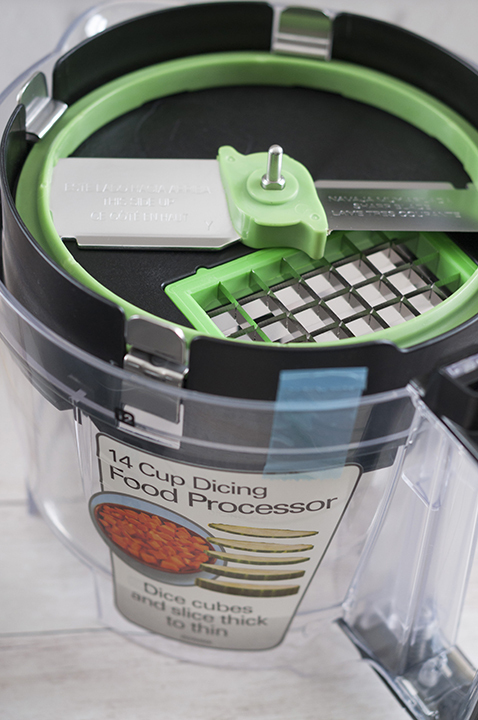 Dice, slice, shred, knead, chop, mix or puree quickly and easily with this bad boy. I have to note that if you are intimidated by cooking a nice roast like I used to be, Certified Angus Beef website has a ton of tips on choosing the perfect roast and how to cook it (no matter what method you choose). They also have a Roasting Timetable which is my lifeline when I cook any sort of beef. You can look up beef cut, weight of the roast, oven temperature, thermometer reading, and cooking time (minutes per pound). They make it easy for you! 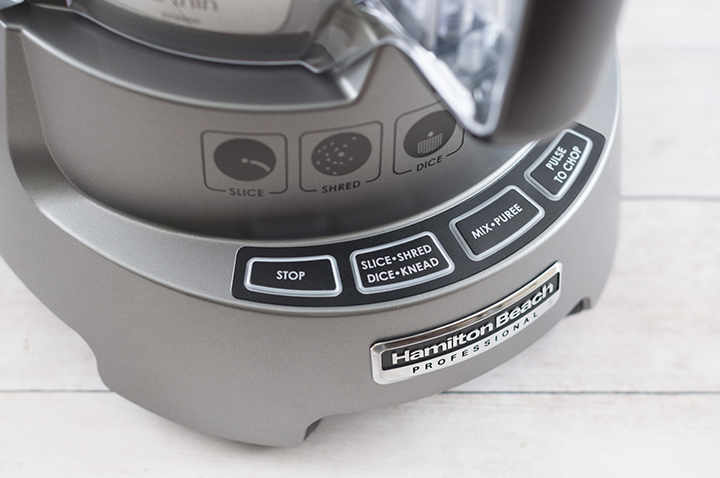 Thanks to the very generous people over at Hamilton Beach, one lucky Wishes and Dishes reader is going to receive their own shiny, new food processor (worth $250)! Make this delicious New York Strip Loin Roast with Garlic-Herb Crust for your special occasion dinner and also scroll down to the giveaway form for your chance to win! It’s super easy! If you don’t happen to be the lucky winner, this food processor is available on their website or on Amazon. 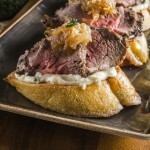 New York Strip Loin Roast with Garlic-Herb Crust + GIVEAWAY! 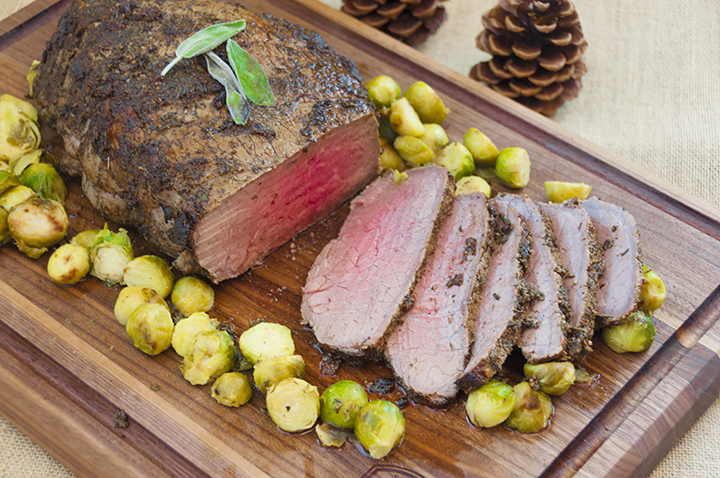 New York Strip Loin Roast with Garlic-Herb Crust recipe is a wonderful holiday meal to prepare when you want to pull out all the stops and impress people. Place the garlic into your food processor; blend/process until finely chopped. Add sage, thyme, oil, salt and pepper and process until a paste forms. Preheat oven to 450°F. Place meat, fat side up, on a wire rack in roasting pan. Roast meat 15 minutes. Reduce oven temperature to 350°F. Roast meat until instant-read thermometer inserted into thickest part of meat (inserted from the side of the roast) registers 135°F for medium-rare, about 35 minutes (or 145°F for medium, about 40 minutes) or to your desired degree of doneness . Remove roast from oven and tent with aluminum foil. 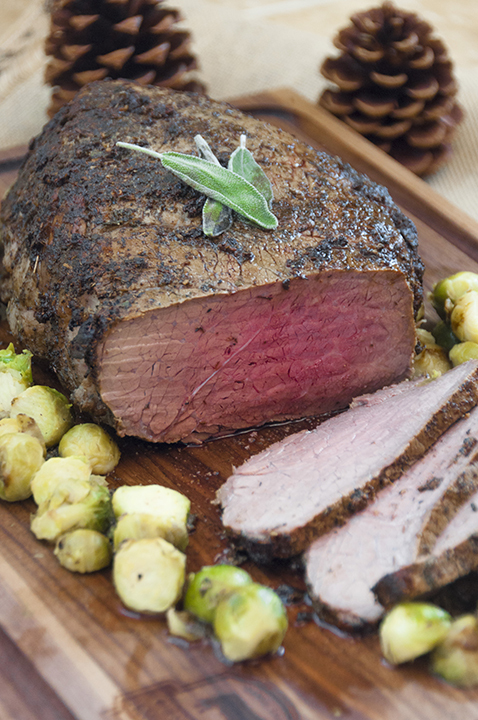 Allow roast to rest approximately 10-20 minutes before serving to redistribute the juices. The temperature of the roast will rise 5° F during standing. Slice across the grain into ⅓-inch-thick slices. Arrange slices on platter and serve warm. 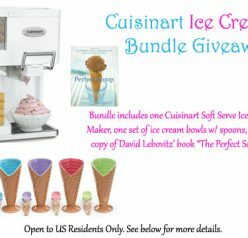 Summer Ice Cream Bundle Giveaway! What a gorgeous roast and great giveaway! Happy New Year! That roast looks fantastic and I would have loved to have this for Christmas! That Garlic-Herb rub is calling me too! 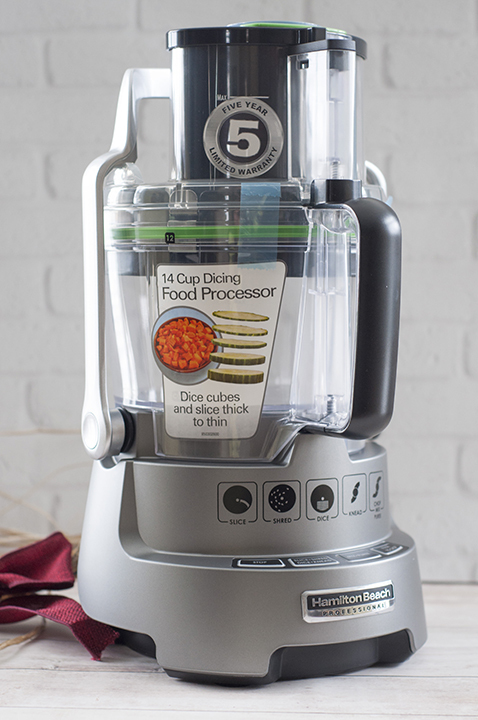 I would LOVE to win this food processor!! And this is a fantastic recipe, Ash! Happy New Year! This roast looks absolutely amazing! 🙂 Love that herb crust. What an absolutely gorgeous looking roast!! Perfect in every way. Happy New Year to you both! What a lovely way to showcase a beautiful roast! Thanks for allowing us to be part of your holidays. And congrats to the giveaway winner!